Testimation Technology enables Users to predict & measure Cyber-Risk; the foundation of this capability being Test Effort Estimation (TEE). The only universal manner in which to validate Testimation Technology, & evade accusations of false testimony, is via its own creation & publishing the results with full disclosure. Therefore one expects that a tool capable of predicting & measuring Cyber-Risk, to accurately forecast the Test Effort required to validate its own development. 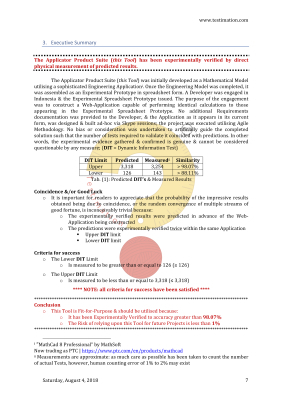 The Proof-of-Concept (PoC) document available for download, contains all of the experimental evidence gathered during the development of the product suite; thereby validating Testimation Technology to experimental accuracy greater than 98.07%. Where would you expect most of your Cyber-Risk to be; System-Penetration perhaps ? This is an interesting question & the answer may not be what you might expect. You can use Testimation Technology to model & analyse your Business Cyber-Risk to answer this question. What is the difference to Cyber-Risk between Testing & Quality Assurance ? Watch this video to learn the answer. What is the difference to Cyber-Risk between System Testing (ST) & System/s Integration Testing (SIT) ? Testing for connectivity between systems; typically performed during environmental commissioning or changes etc. Ever wondered if Functional Defect Discovery (FDD) has a physical analogue ? .... As it turns out, it does. 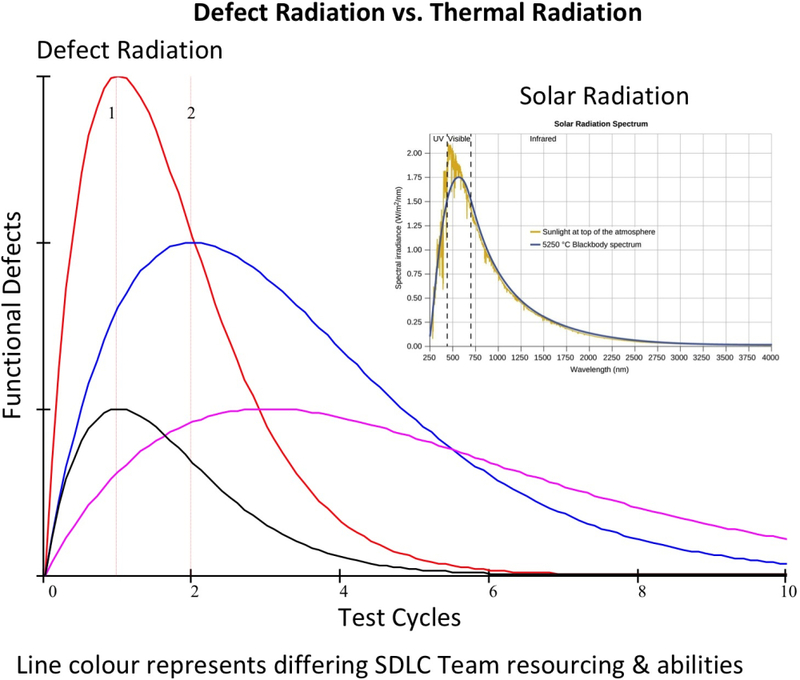 Cyclically discovering & fixing Functional Defects is analogous to Thermal Radiation; the farther you step back from the fire, the fewer Functional Defects you will find in each Testing Cycle. A cyclic approach to Testing is fundamental (e.g. Progressive Testing followed by Regressive Testing), & a primary firewall between an operational business & being in dire straits. Watch this video to observe the distinct correlation between Cyclic Testing & Thermal Radiation. Connecting these phenomena is an important step in predicting & mitigating Cyber-Risk. It is impossible to predict any form of Cyber-Risk unless it is modeled in some mathematical form. In the absence of a mathematical construct, predictions are nothing more than speculative guesswork. How many Testing Cycles does Cyber-Risk mitigation require ? .... The answer to this question has two key elements; theory & practice. Watch this video to see how we translate a complex Mathematical Model into a simple table demonstrating that, the key to answering the question raised, is entirely dependent upon the commitment to Defect Fix Ratio (DFR) per Cycle by the Development Team. If your Development Team commits to a DFR of at least 74(%) per Cycle, your Software Project will (generally speaking) not need more than two Cycles of Testing (Iterations per Sprint) to mitigate most Functional Cyber-Risk. This means that they must commit to permanently fixing at least 74(%) of Defects raised per Cycle. If this can be achieved, all your Critical, High & Moderate Severity Defects will be fixed by the end of your 2nd Cycle; leaving only the Low Severity Defects remaining. At this point, the business can decide if fixing the outstanding Defects is economically warranted. As is customary with Testimation, we support conclusions via rigorous Mathematical Modelling to ensure that theory concurs with observation & expectation. What is the difference to Cyber-Risk between Software Development Life-Cycle (SDLC) methodologies ?